Marathon Music Works filled up this past Saturday with a sellout crowd of some of the friendliest people you’ve ever met. “Your dress looks so pretty with your eyes,” one young woman in a flouncy dress and cowboy boots said to me, as she squeezed past to get to her seat. 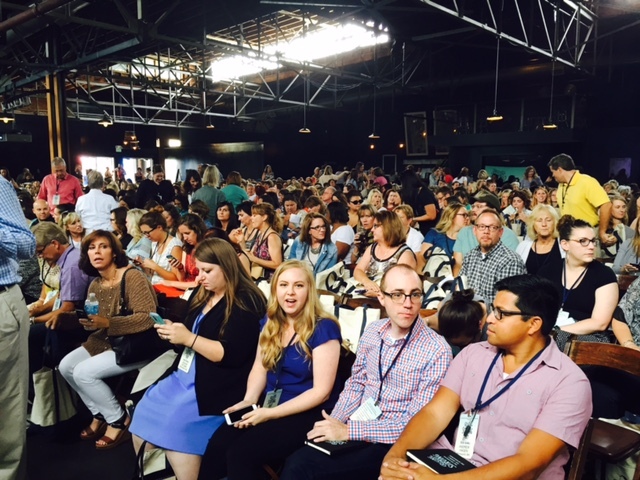 The middle-aged woman sitting next to me had driven with a co-worker from Indiana to hear Brené Brown speak. A mother from West Virginia and her daughter in grad school at Vanderbilt sat behind me. I asked the mother if she thought my 14 and 16 year old daughters were too young to listen to Brené’s TED talk. “No, no, no!” she assured me. “I made both of my daughters listen to it when they weren’t much older! The most important thing is to learn how to talk about hard things together.” As more than 700 of us gathered – live bluegrass music in the background – the atmosphere was half revival, half conference, all goodwill. When Brené Brown took the stage, she was greeted by a standing ovation that almost brought her to tears. The people who attended this all-day event – the launch of her latest book, Rising Strong – love her. After hearing her speak, I can see why. You’ve maybe heard of Brené. Her TED talk on vulnerability is one of the top 5 TED talks of all time, 19 million viewers and counting. She’s written two #1 New York Times bestsellers, Daring Greatly and The Gifts of Imperfection. Brené focuses on failure in Rising Strong. She thinks that failure is having a moment in our culture: everywhere you look, there are failure conferences, business books on failure, self-help books on failure. She calls this “glamorizing failure” – or “gold-plating grit” – because most of it goes straight to the end of the story: how you succeeded after you failed. There isn’t much time spent on the shame, anger, or despondency you feel when you’re punched in the gut by failure (whether personal or professional, large or small). Brené says that the most important first step is not to ignore those feelings. You have to “lean in” to the discomfort, which is no fun, but which is the only way to make sense of what is going on. This is the first step she outlines in Rising Strong, and she calls it “The Reckoning.” It’s about figuring out what you’re feeling – and what story you’re telling yourself about what just happened. Brené told a story about herself and her husband to illustrate the process of “rumbling.” She had been in her dining room working on one of her research projects – the table entirely covered with stacks of paper – when she heard her husband open the refrigerator door and mutter, “Jesus, we don’t even have any lunch meat.” Brené walked into the kitchen, blood pounding. “Steve,” she said, beginning quietly. “I bet you have a car that can go west on — road. I bet that road will get you to the grocery. I bet your credit card works. I bet you could find the deli in the grocery and buy some lunch meat with your credit card. 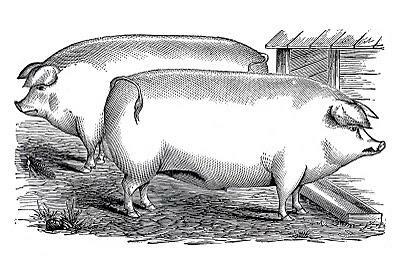 Then you could drive back on — road, in your car that works, and we would have lunch meat in the refrigerator.” She was no longer speaking quietly. “Wow,” he replied. And things got worse from there. She was negotiating custody arrangements in her head later that evening. She was feeling overwhelmed by work, the kids, the house, and the demands of getting dinner on the table – and feeling like she was not doing any of them well. Steve was not angry at her in that moment at the refrigerator. He was not resentful. He did not think she was a half-assed failure of a wife and mother. He was hungry. Brené had to figure out that the story she was telling herself was wrong when she responded in anger to Steve – it was a story about inadequacy and unlovability – before she could get to a better place with her husband. 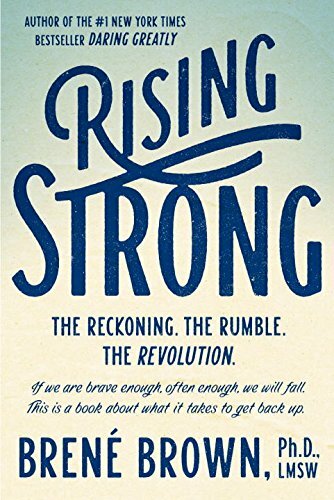 The heart of Rising Strong explains ways to “rumble” with the stories we tell ourselves, and it is full of both personal anecdote and research. If you haven’t been to Marathon Music Works: very cool venue! It’s all exposed bricks, dark wood, huge ceiling fans, natural light from windows up high. It manages both warmth and industrial chic. Sincerest thanks to Niki Coffman at Parnassus Books who secured me an invitation to Saturday’s event, sponsored by Random House and O, the Oprah Magazine. Beautiful report! Sounds like a must read.